A note from RJ – This guest post is by my friend Shafiur Rahman, whose films I’ve posted about several times on Vandalog. 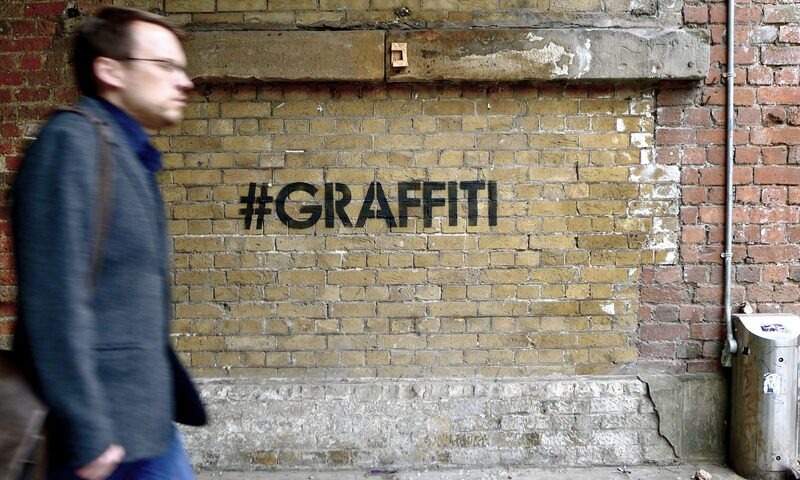 Shafi is an interesting figure in the London street art community. Yes, he can be seen wandering around Shoreditch looking at work or at the gallery openings, but he isn’t just a street art fan boy. He is interested in street art, but his film company makes films about a wide range of social issues. 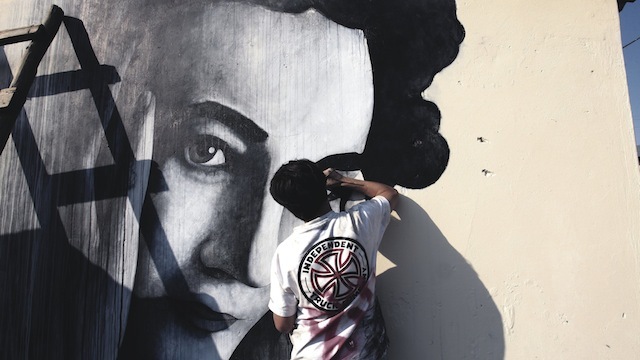 On a few occasions, he’s been able to bring a bit of politics back into street art and muralism by involving street artists in his other film projects. What he writes about here is just one such instance. In 2010 I started filming a film about apartheid in South Africa. After conducting several interviews, I realised I had interviewed – unwittingly – various members of the Picasso Club. These were activists who used to paint anti-apartheid slogans in the dead of night in the city of Johannesburg in the 1960s. Some of the members of the club are still alive and they have led very distinguished lives – everything from 26 years of imprisonment to holding high office in the post-apartheid government of Nelson Mandela. These Picasso club guys gave me an idea. It dawned on me then that I could use street art meaningfully in my film. A kind of sloganeering too because I had in mind to paint giant portraits of those who had died in the struggle and who were now fading from memory. Fading both in terms of being easily recognised and in terms of the spirit they embodied: selfless struggle and sacrifice, I think is the phrase here. So the art would question the viewer – who is this you are looking at and why here. I had in mind to paint people who had died in the struggle and were intimately connected to the places where they would be painted. It could be where they worked or where they lived or where they were killed. So Ben Slow painted Ruth First. She was a white Jewish woman, a communist party member and a dedicated fighter against apartheid. The apartheid regime killed her with a letter bomb. 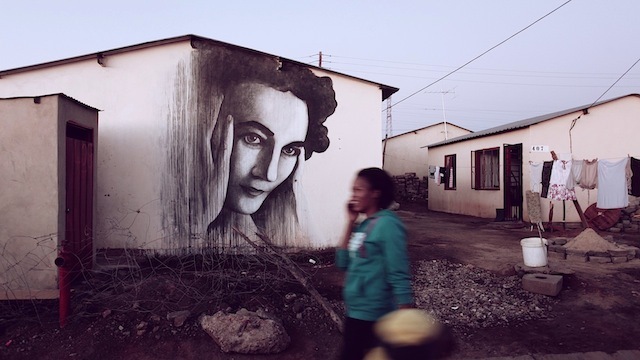 We painted her at a spot not far from a place called Kliptown. This was the place where the Freedom Charter was adopted by the many organisations fighting apartheid. Over the years the Freedom Charter became the central document outlining an egalitarian vision of South Africa. Ruth First helped draft that document. We painted her in a community which has experienced much violence and continues to do so. The building we chose was big enough to paint the 4m mural. Surrounding it are other smaller dwellings with no electricity or running water. 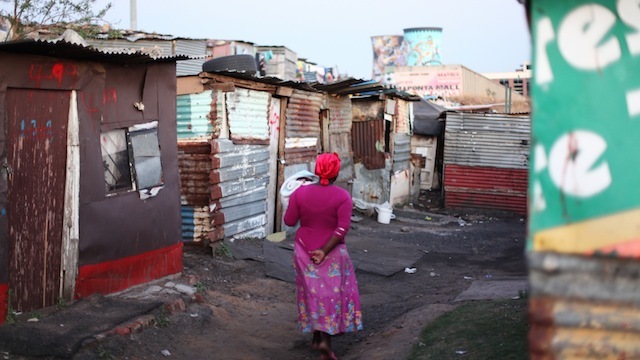 They are simple one-roomed tin shacks. The legacy of apartheid is still evident in 2012. Sadly the values Ruth embraced and fought and died for are less evident in today’s South Africa. That is the general feeling. Picasso Club members despite their loyalty and polished diplomacy betrayed similar feelings in their interviews. The people of Nomzamo park loved the mural. Some had a notion of who Ruth was. Most did not. One guy who knew of her kissed Ben’s hand and said he loved him for painting her.